With thousands of people arriving and departing in a short space of time it is essential that the organisers and competiting Islands are able to manage where / when people arrive / stay / depart. 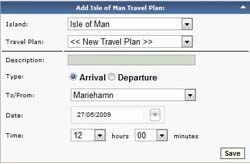 As the majority of people will be travelling together in one group the system makes use of the concept of "Island Travel Plans". By using multiple Arrival / Depature plans it simply becomes a case of giving the plan a descripition, specifying the relevant port and time and then just allocating people to the relevant plan. By doing it this way it becomes much easier to manage large groups of people who are travelling together, as well as making it much simpler / faster to make any changes should travel plans change as the change only needs to be made once. The Accommodation page allows Site Administrators to manage the various Hotels and other Providers that are going to be providing accommodation for visitors during the Games. Apart from the basic requirement of a name for the hotel, other information such as telephone, fax, email, and address can also be entered so that it is readily available if needed. The information entered here is then used during the registration process to record which person is staying where during the games. 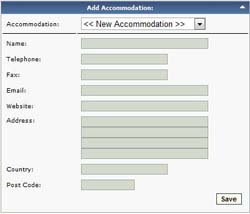 The Accommodation and Travel Reports also allow users to filter the report by Accommodation by simply selecting it from a dropdown. If necessary, there is also the ability to enter alternative travel and accommodation for a registrant rather than using an Island Travel Plan. This is necessary if a person is perhaps staying at a residential address, or has made their own seperate arrangements to get to and from the games. Travel is entered in a similar way to creating a travel plan, and the accommodation is simply a textbox. This information can also be reported on specifically in the Travel and Accommodation reports. In much the same way as the accommodation providers, the ports page allows you to maintain the information on the various ports such as airports and ferry terminals that may be used for arrival / depature to the event. As with accommodation, this information can be used to filter reports such as the Travel Report, enabling you to easily report on who is arriving where and when at ease.